Looking for an iPhone app to spruce up your St. Patrick’s day? Holiday Camera is an app for St. Patrick’s Day, Valentine’s day & Christmas that lets you take pictures on your iPhone and turn them into holiday greeting cards using pre-built holiday themes to add flare and personalize your photos. Holiday Camera is great for the whole family during the holiday seasons and works great on the iPhone. Using the app is quote simple as you might imagine. 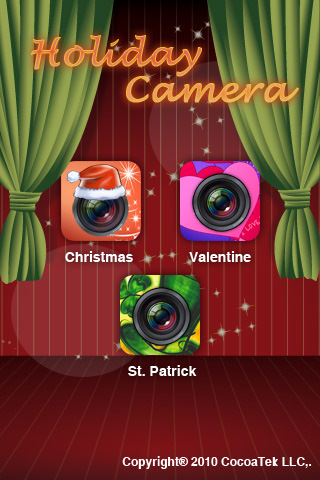 When the Holiday Camera app starts you get 3 choices: Valentine, Christmas and St. Patrick’s Day. Tap any button and you’ll get to the next screen where you’ll see the default theme overlaying the view from your iPhone’s camera. You can tap the gift box icon to flick through the set of provided themes for the given holiday. Position your iPhone to where you want the subject to appear in the photo and tap the middle button to snap the photo. You can use the slider button to zoom in/out on your subject for a better fit. Your holiday themed photo is saved to your Camera roll. You can get to the camera roll by tapping the eye button on the right, and view your new photo from within the app. From there you can confirm your creation and email it to anyone you like. Pictures are saved in the normal iPhone size (640X480) and you’re able to switch between seeing them in either full size or shrunk to fit size from here. The app gives you 15 Valentine Themes, 15 Christmas Themes but only 6 St. Patrick’s Day themes. The graphics for the themes and the app itself are very colorful, clean and sharp. You can’t use your existing photos with this app which is kind of a bummer for iPod touch users or for people who don’t have the subject person around to snap a photo of. The christmas and valentine’s day themes play an opening theme song once you start them, which is nice, but strangely enough not the St. Patrick’s day theme. Finally, there is apparently no way, other than quitting and reopening the app, to switch from one holiday to another. Overall, Holiday Camera is a great idea for simple, easy to add holiday flare to your photos on your iPhone. There is room for additional holidays and additional themes, which could make it even better going forward. If you’re into dressing up your photos and get a kick out of the holidays, grab yourself a copy of Holiday Camera and have some fun. AppSafari review of Holiday Camera was written by Joe Seifi on March 17th, 2010 and categorized under App Store, Fun, Photos. Page viewed 5606 times, 2 so far today. Need help on using these apps? Please read the Help Page. This seems to be a good app especially during the Holidays! Thank you very much for sharing this one. I am in search for apps like this so that I can have personalized greetings cards.